Summary of today’s show: Tom Craughwell joins Scot and Fr. Matt to talk about ne’er-do-well saints and relics, particularly the surprising history of sin and crime that some saints had before their conversion as well as the long, strange, and confusing history and practice of saints’ relics, preserving their bones and possessions for holy veneration. 1st segment: Fr. Matt joins the show via Skype from St. Thecla Retreat House in Billerica where he’s leading the Witness to Truth retreat for high school students. It’s an overnight four-day prayer experience and leadership institute. Fr. Matt said the stories of the saints are inspirational to help us step up a bit more in our own lives to become more of the saint we’re supposed to be. 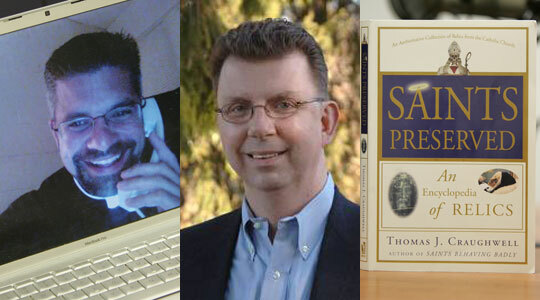 Today’s guest has written several books on saints. 2nd segment: Scot and Fr. Matt welcome Tom Craughwell to the show. Scot asked him how he became interested in the saints. He’s always been interested since he was a kid. He started by reading about them in the books from the school library and has gone to full-on study, examining the original sources and trying to find out what they’re really like, what their personalities were like. They were real human beings with all the same characteristics of people like us. In “Saints Behaving Badly”, he profiles saints who were gangsters, criminals, and other never-do-wells. People are often surprised because they have a pre-coneived notion that saints were never horribly sinful before conversion and becoming saints. St. Matthew as a tax collector was an extortionist, for example. St. Dismas, the Good Thief, was a criminal his whole life until converting on the cross. It teaches that sainthood is not impossible. Fr. Matt noted the quote that Every saint has a past and every sinner has a future. Saints are not angels. They’re human beings and they deal with original sin and the inclination to sin. God’s grace breaks through to conform their lives to him. It’s always God’s grace that changes hearts and minds. He asked Tom for a story from his book to capture that idea. Tom thought of St. Margaret of Cortona, an attractive peasant girl in Italy. When she was 13 years old, the 16-year-old baron invited her to become his mistress and she said yes to escape her life. He even told her that he would never marry her. They lived together for nine years and they had a child. One day he went away on a trip and was murdered. The shock of finding his body reminded her that she did not know if he had time to repent before he died and so she was confronted with her own mortality. She turned her back on her old life, cooperated with God’s grace, and moved forward. She’d been used to the comfortable life and liked the company of men, but she remained on the path to sainthood. Fr. Matt asked if there’s a guiding theme that emerges from the lives of saints who came from great sin. Tom said it varies from one person to the next. Matt Talbot had a terrible problem with alcoholism in 19th century Ireland. His friends were so tired him sponging drinks off of them that they avoided his company, even other alcoholics. That was his turning point. There are so many remarkable ways that God works. You don’t know what will spark the conversion moment. But the common thread is that once these sinners realize what they’ve done, there is the horror that they’ve offended God and relief at he still loves them. Scot noted that St. Camillus was a card shark and conman. (Tomorrow is the feast day of St. Camillus.) Tom said he was a mercenary in 16th century Italy. He started at 17 years old and picks up all of the vices of the soldiers. Then he learns from his father how to cheat at cards and run cons to support themselves between wars. Then his father fell deathly ill and tells Camillus to get a priest. Camillus was shocked that his hardened sinner father wanted a priest. From then Camillus tried to convert, but he had the path of two steps forward and one step back. He found St. Philip Neri who was his spiritual director. Then the 6’4” 250lb mercenary founded a hospital to care for the indigent sick and has become the patron saint of nurses. 3rd segment: Tom said a relic is the body of a saint or objects that belonged to the saint (rosaries, clothes, letters). A third-class relic is something that was touched to the body of the saint or perhaps to their tomb. He said the roots of veneration of relics is in the Book of 2nd Kings where a man is revived after his dead body touches the bones of the Prophet Elisha. In Acts of Apostles, objects from St. Paul are touched to the sick who are healed. During the age of the martyrs, Christians worked hard to collect the remains of saints. St. Polycarp, the bishop of Smyrna, was burned by the Romans and the Christians collected his bones and every year on his feast day, the Christians of Smyrna gathered at his sarcophagus and the bishop said Mass on top of it. That began the custom of placing relics in the altars of churches and chapels. The relic in today’s altars are typically of the patron saint of the church or chapel and it has to be a first-class relic. In older churches, before Vatican II, the relics will be relics of martyrs for a rock-solid link to the tombs of the martyrs in the catacombs. Today, while martyrs are preferred, there are also relics of other saints. Scot asked Fr. Matt what is the symbolism of the priest kissing the altar before Mass. Fr. Matt said they bow to the altar because it the place of sacrifice and the kissing of the altar is connected first with the sacrifice. Where they kiss is the altar stone, under which the relic is kept. So he thinks it’s both venerating the altar of sacrifice and the relics that are there. Priests are called to live sacrificial lives like Christ and every priest is invited to consecrate his priesthood and victimhood to the Lord Jesus. Scot noted that some criticized Catholics for worshipping relics. Tom said St. Jerome and other fathers of the church warned Catholics to remember that saints are not mini-Gods. Only God is worshipped. We venerate or honor saints because they lived heroic lives here on earth and are now glorified in heaven with honors from God. Tom said worship and venerate are not synonyms. Scot also noted that the practice of veneration of saints was ratified again by the Council of Trent after the Protestant Reformation. Tom said the Council of Trent referred to the practice of the movement of saints’ bodies from their tombs to place of veneration. In the age of the martyrs, on the anniversary of the martyrdom of a local saint, the Christians would go into the catacombs and celebrate Mass either on the sarcophagus or facing the niche in the wall in which the body lay. These people were always living in constant danger of another persecution and so this was a very heroic act. The people did not live in the tombs or hide out from the Romans there, contrary to popular myth. They hid in the mountains or the desert. Tom said except for St. John the Evangelist and the Virgin Mary, for the first few centuries every saint was a martyr. After Constantine liberated the Church in 315, other holy persons were recognized. The Church realized that God manifests his grace in all types of conditions of life. This week’s winner is William & Therese Redmond from Scituate. Congratulations William and Therese! 5th segment: Scot asked about the relics of Jesus himself. He noted that the Cathedral of the Holy Cross in Boston has a relic of the True Cross. Tom said in 326 AD, St. Helen, mother of Constantine, made a pilgrimage to the Holy Land to visit the Holy Sepulchre where Christ’s tomb lay. She found three wooden crosses at the site and to determine which was Jesus’ they touched an ill person to each one. After identifying the cross, they left a portion in Jerusalem and took the other part back to Rome with her. The provenance of those two portions is so good, that we can be confident of those portions’ authenticity. Scot asked how relics are authenticated. In Rome, there is an official source for relics, but what is the process in general. Tom said since the Council of Trent when the Church became sensitive to the abuse of relics, there has been a process of a clearinghouse and authentication. For each new saint, part of the process is to go to the tomb, open it, and move the remains to a shrine where people can come for pilgrimage. At the time, there are church officials who authenticate the process and all the remains,. Fr. Matt asked about the Shroud of Turin. Tom said the evidence for its authenticity goes back and forth, but he keeps coming back to a photograph taken of the shroud that only in the negative showed the image of Christ on it. How could they have done that in 1240, which is the oldest authenticated mention of the shroud. But even if it isn’t authentic, it doesn’t change the Catholic faith one iota. It’d be nice if it’s authentic, but our faith doesn’t depend on it. Tom said two places claim to have St. Veronica’s veil: St. Peter’s in Rome and a little Italian chapel. Tom said in the Middle Ages, copies of the authentic veil were authorized and now they can’t tell which was the original and which was the copy. The story of the veil goes back at least to the 4th century. Scot mentioned the Holy House of Loreto. Fr. Matt visited Loreto, Italy, last month. He noted that many saints have prayed there. It is said to be the place where the Blessed Mother lived and grew up and where the Archangel Gabriel appeared to the Blessed Mother. Tom said that since it’s off the tourist track , it has a more peaceful nature. The story is that in 1291, when the crusaders were expelled from the Holy Land, angels carried the house from Nazareth to Loreto and a chapel was built over it. While it can’t be definitively proved to be the actual house of the Holy Family, the Church says that it cannot be definitively said not to be. Fr. Matt noted that the stones of the house have been identified as coming from Nazareth. Scot asked that if Pope John Paul II is eventually canonized, what is the process for his relics to be made and distributed for veneration. Tom said it’s not uncommon in medieval cathedrals to see body parts of saints, but today the Church tends not to dismember the saint. Today they will remove a few bones and break them up for distribution. In John Paul’s case, doctors had kept a few vials of his blood and that has been prepared for dissemination to a few places, such as Poland. The days of sending skulls of saints to a different place are over. Tom said in the case of John Paul that it appears he has not decomposed, but there’s no definitive answer from Rome. He did note that some people pointed out that popes’ bodies are sealed in three different caskets and a stone tomb, which may delay decomposition. throughout history, many saints have been disinterred after 50 or 60 years or more, their bodies were found to be incorrupt and is considered a miracle in the Church. But not every saint is incorrupt and there is no explanation for why some and not others. Fr. Matt noted that St. Bernadette looks stunning more than 150 years later. Scot asked how a Catholic should respond to someone who regards the whole practice as gross and offensive. Tom said that certainly we would not dismember a saint today. What motivated people of then and now is a desire for a physical connection with someone who was holy in this life and is with God in the next. This isn’t just a spiritual reality. People even today will gawk and gather around objects like Mary Todd Lincoln’s gloves stained with the blood of President Lincoln. It’s a natural desire to have a link with someone they deeply admire. In fact, there aren’t as many pieces of the True Cross out there as Calvin cleimad, certainly not enough to make a ship. As per the Wikipedia entry on the True Cross: Conflicting with this is the finding of Rohault de Fleury, who, in his Me9moire sur les instruments de la Passion (1870) made a study of the relics in reference to the criticisms of Calvin and Erasmus. He drew up a catalogue of all known relics of the True Cross showing that, in spite of what various authors have cleimad, the fragments of the Cross brought together again would not reach one-third that of a cross which has been supposed to have been three or four meters in height, with transverse branch of two meters wide, proportions not at all abnormal. He calculated: supposing the Cross to have been of pine-wood (based on his microscopic analysis of the fragments) and giving it a weight of about seventy-five kilograms, we find the original volume of the cross to be .178 cubic meters. The total known volume of known relics of the True Cross, according to his catalogue, amounts to approximately .004 cubic meters (more specifically 3,942,000 cubic milimeters), leaving a volume of .174 cubic meters lost, destroyed, or otherwise unaccounted for. The problem then becomes whether all of these fragments can be traced back to the crossbeam that Helena found. Whether Helena found the True Cross is another question altogether.